A surgeon's story from Sunrise Hospital in Las Vegas. 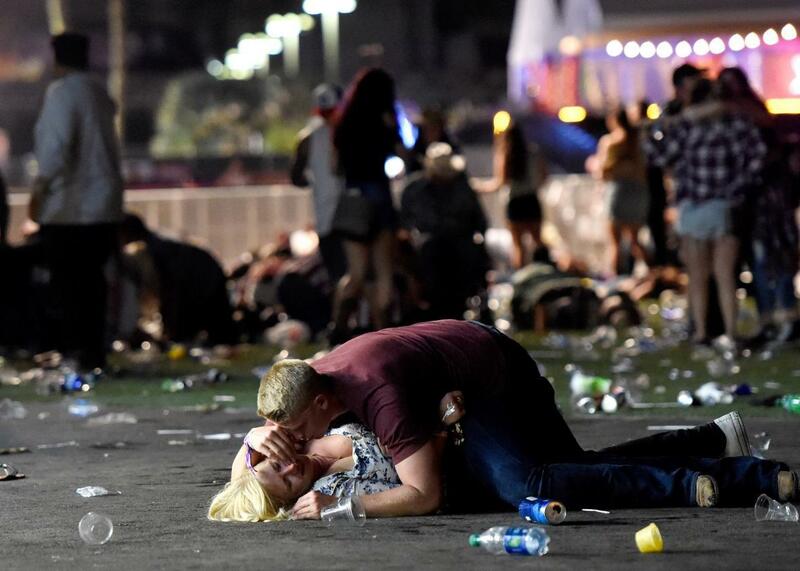 A man lays on top of a woman during the mass shooting at the Route 91 Harvest country music festival. David MacIntyre is a trauma surgeon who was on call on Sunday at the trauma unit in Las Vegas’ Sunrise Hospital. Due to its proximity to the mass shooting at the Route 91 Harvest festival, Sunrise took on more critical patients than any other facility in Las Vegas. In an interview on Tuesday, MacIntyre told me how the night played out from his perspective. His account has been lightly edited and condensed for clarity. I’m the trauma surgeon on call, so I’m physically in house for 24 hours. Around 10:00 we got a page that we had a mass casualty shooting on the Strip, and we all mobilized to the trauma bay. Once we got to the trauma bay, people started showing up. We activated, called the other surgeons to come in, and everybody mobilized very quickly. I didn’t expect this volume. I didn’t expect to see 214 people show up. There were a lot of gunshot wounds to the head and chest. Those are the first ones I saw. These are the people that were scooped up by the citizens here in Las Vegas in their vans and their pickup trucks. They drove them up here to the hospital very quickly. Those are the first ones we saw. Then the ambulances started coming in. They had three or four people in each of the ambulances that they were dropping off. Of the 214 patients, there were around 137 treated and released. A majority of these are the ones we took to the operating room: 10 gunshot wounds to the head, we had eight chests they went to the operating room, we had 13 abdominal wounds that went to the operating room, we had 17 orthopedic injuries that went to the operating, and then we had 33 others. Those are like wounds to the neck or to the major extremities. The first that came in was a gunshot wound to the head and chest. Then I had 10 more patients. Then I had another 10. It was really fast. It felt like seconds. Being triage, it’s very quick. I ask you, “What’s your name?” You’re not talking to me and you’re not breathing—you’re immediately going to get intubated and we’re going to figure out what’s wrong with you. Those that were stable and talking and answered my questions—that were breathing—we would prop them up and then we’d put them over in an area and we made them comfortable, and we focused on those that weren’t talking to us, intubating them and putting chest tubes in, delegating to the operating room or to the intensive care unit. I was triage, so I just directed everybody to the operating room. I’d say I saw at least 70 or 80 people in the first hour. Then the ER doctors had their walking wounded, the gunshot wounds to the arms and legs—they didn’t have any major injuries to the head, or chest, or belly. Those all came to me. All the injuries that I saw were things that I’ve been trained to deal with. We just had so many of them—that’s the part that really was overwhelming. We’ve had gang violence, gang members shooting one another. But we would get four, or five, maybe 10 total and that would be it. This was 191 people, like that. I’ve gone through many classes on mass casualty. You don’t think about it. You hone in. But I started getting nervous, say, three, four hours into it. I was like, People are still coming in. This was the largest mass [shooting] incident in the entire history of the United States and we were able to absorb all those patients into our center. A lot of talented people came together and rose to the occasion. It was amazing. I mean from housekeeping to neurosurgery, all doing one thing. We did have a police officer that we lost. That was probably the hardest thing I saw. The police department was in there with him—they didn’t leave him. We had a morgue set up by the operating room. They had one officer in full uniform holding the American flag folded up, and he stood with that downed officer the entire time he was with us. We had 15 fatalities and some of those were dead on arrival so they never went through the triage on my side—they were already gone.